COIN (COntext-aware INjection) is a client-side approach that makes existing websites context-aware on-the-fly (i.e., as they are being visited by the user), by enhancing them with context-aware features. This is done to reduce the drawbacks of mobile web usage (i.e., device limitations, reduced interaction time) and assist the mobile user in his browsing activity, by guiding him towards relevant content on the website. 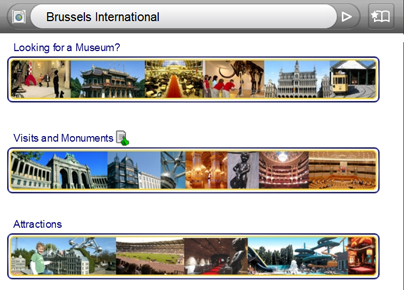 These context-aware features can for instance recommend certain context-relevant items to the user (e.g., in an online shop, souvenirs related to visited places); inject context-sensitive information and aids (e.g., location-specific content can be highlighted based on proximity to the user, and walking distance inserted); and the user can be guided through the website towards context-relevant content (e.g., pages related to products corresponding to his interests). The major contribution of COIN is that it can be applied to existing and a priori unknown websites; no extensive pre-engineering of the website is required. To achieve this, COIN relies on semantic annotations (e.g., RDFa, microformats) increasingly present in websites, which assign explicit meaning to webpage content. Such explicit semantics enable COIN to match existing webpage content to the user's context and environment. Below, we provide a general overview of the approach. For more details, we refer to the publications related to this application. Below, some screenshots of COIN in action can be found, taken from the mobile Fennec browser. 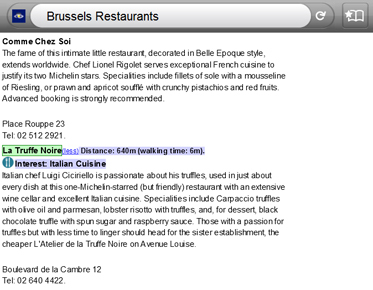 The first screenshot shows a restaurant being recommended to the user, as it serves one of the user's favorite cuisines (this is done by inserting a recognizable icon, together with the matching cuisine). At the same time, some contextual aids and information are inserted as well, namely an annotation showing that the user is currently nearby this restaurant (green rectangle), and the walking time and distance. Screenshot 1. Context-aware recommendation (and contextual information / aids injection). 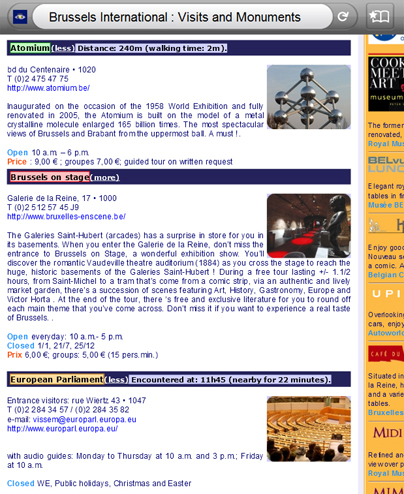 The second screenshot is another example of the injection of contextual aids and information. Currently nearby attractions are annotated in green (and their walking distance inserted), while previously encountered attractions are annotated depending on the time since the encounter (e.g., red is used if longer than 4 hours ago), and the encounter time and time spent nearby are inserted. Screenshot 2. Contextual information and aids injection. Finally, the last screenshot shows the annotation of a link pointing to another page in the website containing relevant information. Screenshot 3. Guiding the user through the website. Van Woensel, W., Casteleyn, S., De Troyer, O.: "A Generic Approach for On-The-Fly Adding of Context-aware Features to Existing Websites", Proceedings of the 22nd ACM Conference on Hypertext and Hypermedia (HT'11), pp. 143-152, Eds. Paul De Bra, Kaj Grønbæk, ACM 2011, ISBN-ISSN 978-1-4503-0256-2, Eindhoven, Netherlands (2011). For more information on this application, please contact William Van Woensel.